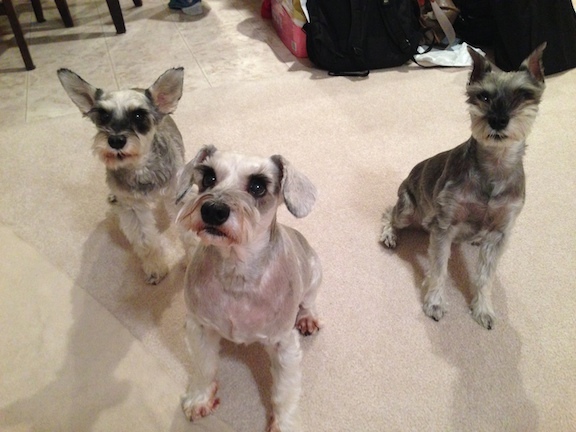 It was miniature Schnauzer day for Dog Gone Problems when I worked with this pack; Wylee, Stormy and Kohlie. Their owners contacted me for help with multiple issues; barking, possessiveness of humans, some anti social behavior and an overall lack of respect for the commands and corrections of their owners. When I arrived for the session, the dogs erupted into an overlapping chorus of barks which is common for the breed. As I observed them it became obvious that each dog had its own unique issues. Their owners were providing plenty of love, in fact, maybe a little too much. I hate to say that as its not the best description. But when we only show a dog love and don’t ask it for anything in return, it can lead to dogs developing behavior issues. When you have a pack of dogs, and some of them are rescues, its important for the owners to be clear and assertive leaders. If the dog’s don’t perceive that to be the case, they often will jockey for the top spot amongst themselves. This is usually accompanied by dogs who don’t listen to their owners unless they feel like it. That was clearly the case in this situation. I started out by suggesting some rules and boundaries to help the dogs start to see their owners as being in a position of authority. Enforcing rules like no dogs allowed in the kitchen when food is being prepared or near the table at dinner time gives owners a great opportunity to define the distinction in authority between dog and human. Next I went over some communication methods that they can use to disagree with unwanted actions or behavior. While its normal for a human to tell a dog “no,” I find its nowhere as effective as using the same sound many animals make as a warning, a hiss. Hissing loudly the second that a dog starts to engage in an unwanted behavior or show interest in an inappropriate object is a great way to communicate that the dog needs to leave it alone or move away. If the dog doesn’t immediately respond, I had them stand up abruptly and turn so that they were facing the dog. To a dog, standing up straight and facing it sends a clear “you have my full attention” message. If you stand up abruptly as soon as they dog gets too close, it will usually stop them and / or cause them to move away. If all of the above didn’t work, the next step is to march directly at the dog with zero hesitation. The dog needs to feel that you are moving oner its current position weather they move or not. If you are slow or tentative, the dog will likely ignore or barely respond. So its important you move deliberately and with attitude and purpose. By consistently disagreeing with unwanted behaviors in this manner, the dogs will learn to take their owner’s first command or correction to heart. It will take a week or two of application of these consequences before the dogs completely adapt new behaviors so it will be very important their owners consistently apply them. To help the dogs learn how to control themselves around each other, I went over an exercise that asks the dog to ignore a high value object lying in the middle of the floor. I started out with Wylee which was a bit of a challenge as she is nearly deaf. I adapted the exercise a bit to allow for tapping to help communicate with her and ending it sooner than I did with the other dogs. One by one we practiced with them until each dog surrendered and told us they understood the object was our by laying down or walking away. I helped their owners go though the exercise as it will be important for them to practice it daily for the next week or two. By repeating the exercise and increasing the level of difficulty by asking the dog to wait for gradually increasing periods of time, they will develop their ability to self-restrain. By the end of the session, the dogs energy was noticeably lower and they were much more respectful and responsive to their owners. Application of the new rules along with practice at the leadership exercise will help the dogs start to see their owners in the top position. Once that perception is made by each dog, its attempts to take the top spot by challenging the other dogs int he house will stop. The new methods of communication combined with the escalating consequences will make it easy for their owners to enforce the new rules and limits for the dogs to follow. They will likely attempt to push the boundaries for the first week or so, but if their owners keep at it, they will give up these unwanted behaviors as well.